Would you believe that over 18 billion USD is lost every year by shipping businesses? I didn’t, until I saw data from NAPA’s new Fleet Intelligence service last month. NAPA Fleet Intelligence is the first comprehensive tool that can calculate the amount of fuel wasted by the global shipping industry yearly. With this new tool, we are able to analyze the efficiency of each voyage sailed vessel in the global fleet and estimate the financial cost of fuel inefficiency. The first time I really understood what “Rush to Wait” meant was when I was working as a navigational officer for a container feeder vessel in the Baltic and North Sea. We had departed a couple of hours late from our last container terminal in Rotterdam. Steaming full speed ahead, we took the Kiel Canal shortcut instead of the route around Skagen, in order to make it in time for our terminal slot in Helsinki. A couple of hours before reaching the pilot station, we were called and told that there was another ship being loaded at the terminal. We would need to wait 12 hours before we could dock. Our Chief Engineer was furious – if we would have known this even a day earlier, we could have slowed our speed and saved several tons of fuel. We calculated that in this single voyage we had lost over EUR 15.000 on fuel and canal fees due to our rush to reach Helsinki on time. A couple of years later I began working for NAPA on voyage optimization tools for ships and shipping companies. There, I bumped into this phenomenon again. My previous experience was not a one-off case. From my discussions with various captains, the same frustration came up repeatedly. After sailing at high speed to reach their destination, they would be informed last-minute that the port call was delayed. Everyone was aware that such a scenario caused a huge amount of waste but no one seemed to care or was easily able to calculate the exact loss. The above picture shows the mechanism of “Rush to Wait”. 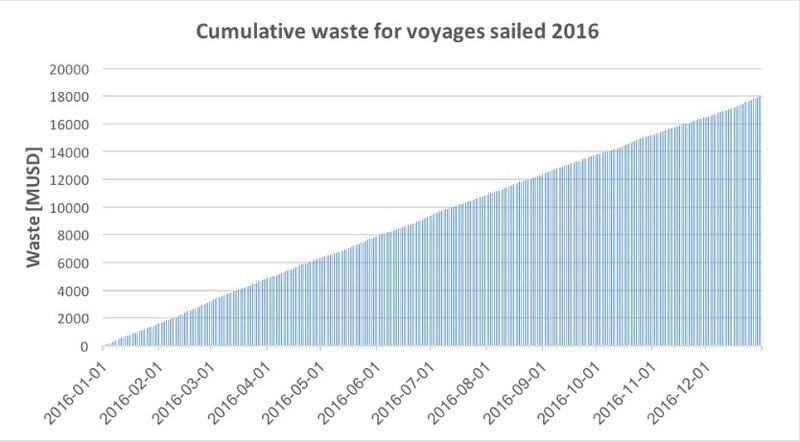 The blue curve shows a speed profile of a real voyage with significant slowdown towards the end due to last minute information about delayed port arrival. The yellow line shows the optimal speed profile for the same voyage with the same time of arrival. The difference is huge. The savings on the latter voyage would have been 17% in both fuel costs and greenhouse gas emissions. The reason for this difference is that higher speeds increase fuel consumption, the rate of which is much higher than lower speeds. Even the slow down period towards the end of the voyage does not compensate for the difference. This applies to all ship types. So why do ships rush to wait? We have identified two main reasons. The first is the tendency of vessel operators onboard wanting to ensure their vessel arrives at the requested time. This cautious behavior is understandable in terms of wanting to avoid arriving late. Unfortunately, this anticipation leads to fuel waste. It is often driven by the charter party clauses or voyage orders defining the voyage execution in a way that causes penalties for late arrivals or sailing at slower speeds than required even when there is no chance to get to the port immediately on arrival. 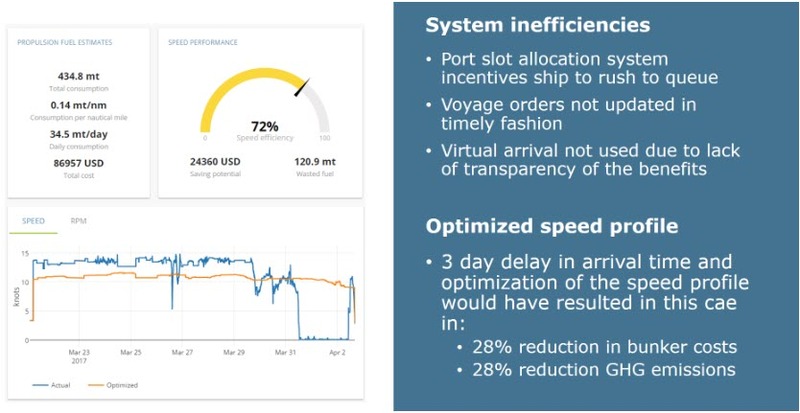 The second reason is simply down to the challenge of delivering information about expected port delays from shore-to-ship. There is seldom a proper mechanism to communicate the times of free terminal slots from port to the ships arriving, which is the reason for this waste in the majority of cases. It should be also mentioned that the business model in shipping business does not encourage seriously considering the big picture in the fuel consumption with misaligned incentives between stakeholders like charterers, operators and owners, and the traditional contractual structures between them. For example, if the charterer is paying for the fuel, a ship does not have much interest on doing something in favor of the efficient voyage execution because the charter party performance clause would lead to claims. There was an attempt to introduce the so called “Virtual Arrival” which aimed for allowing slowdowns to save fuel in the cases of terminal delays, communicated during a voyage, but unfortunately this has not become very widely used. Publicly available AIS data and greater accessibility to affordable information about the performance of vessels through tools such as NAPA Fleet Intelligence, means the huge amount of cumulative fuel currently being wasted has become much more apparent. It is not sustainable for the industry to continue like this. The possibility of achieving the goal set by the Paris Agreement to reduce greenhouse gas emissions would be much greater if cases of rushing to wait could be minimized – not to mention the cost reductions for all stakeholders across the maritime transport chain that could be achieved. With this data now publicly available, there is a solution to the problem of rushing to wait.